On June 2, the COUTURE Show will start in Las Vegas. Together with our partners of the German Finest family, we are flying the flag for German design and jewelry culture – Lafite Ballroom 612 German Finest Pavilion. 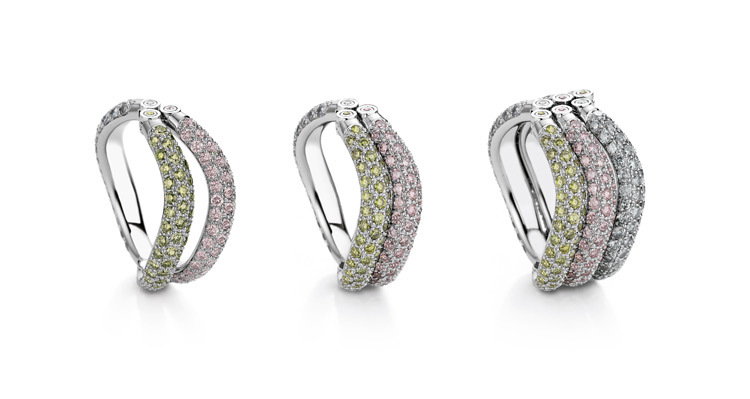 This year, we have submitted two rings from the 2play (Trias) collection for the COUTURE Design Awards, They are combined with each other and can show different colors and combinations due to their changeability. They are made of platinum and decorated with very special natural colored brilliants in “olive”, “pink” and “bluish gray”.